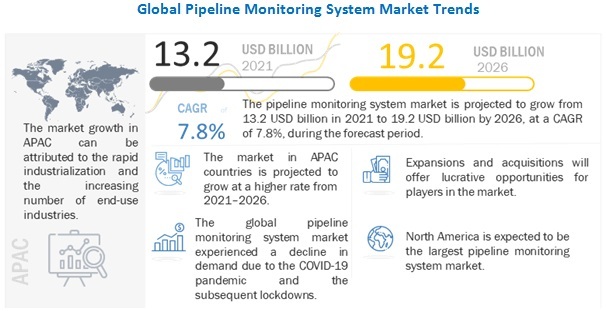 [160 Pages Report] The pipeline monitoring systems market size is estimated to grow from USD 4.13 Billion in 2015 to USD 8.72 Billion by 2026, at a CAGR of 7.1% from 2016 to 2026. The base year considered for the study is 2015 and the market size is projected from 2016 to 2026. The report aims at estimating the market size and future growth potential of the pipeline monitoring systems market across different segments such as pipe type, application, technology, end-use industry, and region. The other objectives include providing detailed information regarding the main factors influencing the growth of the market (drivers, restraints, opportunities, and industry-specific challenges). It also aims to study the individual growth trends, future prospects, and contribution of various segments to the total market. The study also analyzes opportunities in the market for stakeholders and details of competitive landscape for the market leaders. It strategically profiles key players and comprehensively analyzes their core competencies. 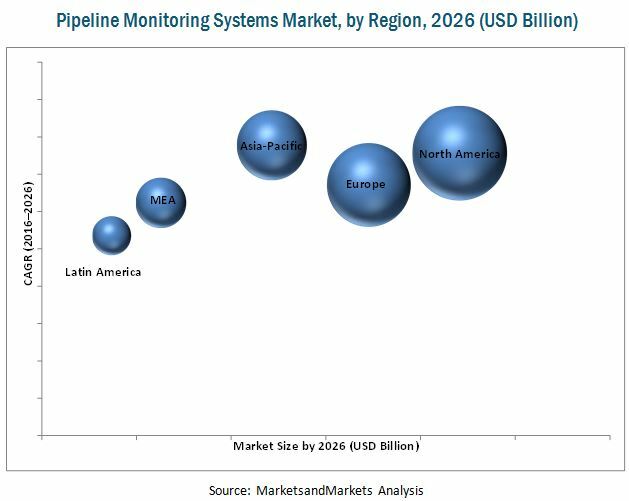 The pipeline monitoring systems market includes pipe and monitoring system manufacturers such as Siemens AG (Germany), Honeywell International Inc. (U.S.), Perma Pipes (U.S.), Transcanada (Canada), PSI AG (Germany), and Orbcomm Inc. (U.S.). Further, the monitoring systems manufactured by these companies are used for pipeline monitoring system companies. The global market for the pipeline monitoring systems market is dominated by players such as Siemens AG (Germany), Honeywell International Inc. (U.S.), BAE Systems (U.K.), Perma Pipes (U.S.), Transcanada (Canada), PSI AG (Germany), Pure Technology (Canada), Orbcomm Inc. (U.S.), Huawei (China), and Pentair PLC. (U.K.), Atmos International (U.K.), Clampon AS (Norway), ABB Group (Switzerland), Future Fibre Technologies (Australia), Senstar Inc. (Canada), Syrinix (U.K.), Radiobarrier (Russia), TTK (France), Krohne Group (Germany), and Thales Group (France). MarketsandMarkets projects that the pipeline monitoring systems market size will grow from USD 4.13 Billion in 2015 to USD 8.72 Billion by 2026, at an estimated CAGR of 7.1% between 2016 and 2026. The pipeline monitoring systems market is expected to witness high growth as a result of increased number of oil & gas leakages in production, pipelines, and storage tanks due to natural disasters and high pressure along with stringent government regulations for pipeline safety and security and expansion and upgradation of pipelines. The growth in trend of the development of new devices and solutions to monitor the pipeline performance, optimize the resources, automate the functions, and safeguard the operations fuels the growth of pipeline monitoring systems. The next-generation technologies, which are the future of the pipeline monitoring market, comprise integrated, multi layered systems using disruptive technologies, Internet of Things (IoT), digital acoustic sensing, and connected pipelines. This report has been segmented on the basis of technology, pipe type, application, end-use industry, and region. The ultrasonic technology is projected to be the fastest-growing segment in the pipeline monitoring systems market during the forecast period. There is a growth in demand for ultrasonic technology in the pipeline monitoring systems sector as it is preferred by major oil & gas companies to detect small and large leakages. On the basis of pipe type, the metallic pipes segment is projected to grow at a higher rate in the forecast period as it is the primary material used in a pipeline industry. This growth can be attributed to its high pressure carrying strength, for any material transporting through metallic pipelines. In terms of application, the leak detection application is projected to grow at a higher CAGR from 2016 to 2026. This growth can be attributed to the increasing investments from oil & gas companies in pipeline monitoring infrastructures and safe transportation of the material through it. Pipeline leakage detection systems help in detecting damages across the pipeline infrastructure. These systems detect leaks on the basis of flow, pressure, temperature, and density. Gas pipelines which are covered under the crude & refined petroleum segment accounted for a major share, which creates a huge potential for pipeline monitoring systems for gas pipelines; this is projected to grow at a higher rate between 2016 and 2021. Also, the construction of number of pipelines in various regions may lead to the growth of pipeline monitoring systems for crude & refined oil across the globe. In 2015, the North American market accounted for the largest share of total market of pipeline monitoring systems, in terms of value, followed by Europe. However, the Asia-Pacific region is projected to grow at the fastest rate than Europe in the pipeline monitoring systems market from 2016 to 2026. Markets in developing countries such as China, India, Japan, Australia, and countries in the Middle East are projected to grow at a higher rate from 2016 to 2026. This is because of the high population in these country, along with new pipelines under construction, which will increase the demand for pipeline monitoring systems. The global market for pipeline monitoring systems is dominated by major manufacturers of pipelines and monitoring systems. Siemens AG (Germany), Honeywell International Inc. (U.S.), BAE Systems (U.K.), Perma Pipes (U.S.), Transcanada (Canada), PSI AG (Germany), Pure Technology (Canada), Orbcomm Inc. (U.S.), Huawei (China), and Pentair PLC. (U.K.) are the major manufacturers of pipelines and monitoring systems in the pipeline monitoring systems market. Other players include Atmos International (U.K.), Clampon AS (Norway), ABB Group (Switzerland), Future Fibre Technologies (Australia), Senstar Inc. (Canada), Syrinix (U.K.), Radiobarrier (Russia), TTK (France), Krohne Group (Germany), and Thales Group (France). These companies use various strategies such as mergers & acquisitions, expansions, new product launches, and partnerships to strengthen their position in the market. 12.8 Huawei Technologies Co. Ltd. Figure 34 SWOT Analysis: Orbcomm Inc.